The Milk Bank continually seeks to provide the highest quality of safe Pasteurized Donor Human Milk (PDHM) to infants in most need. We know that the variability of nutritional content of donor milk can be a concern for the adequate growth of fragile infants. We are pleased to be able to provide nutritional analysis of PDHM for each target pool of donor milk. We intentionally mix donors’ milk in volume-specific ways to obtain a minimum of 20 calories per ounce for hospital clients. While this does not replace the process of monitoring babies’ individual growth, it is an extra tool to ensure optimum nutrients for fragile infants in hospital care. We’re happy to share there will be no increase in the purchase cost for all of our PDHM. Do you have questions about our new process we can help answer? Email us at engagement@themilkbank.org! Have you ever wondered what really goes into pasteurizing milk? There is so much more to it than anyone ever thinks! We've previously talked about the larger equipment that is required to process milk such as the pasteurizer itself, but there are smaller and equally important pieces as well. Some of the smallest but most important things we use are data loggers. They are about the size of a hockey puck but their use is of utmost importance. These little things track and log the temperature of the milk every minute during the pasteurization cycle to ensure the milk is properly processed. Without these, we would not be able to show the milk actually went through the pasteurization process. Each batch of milk that is done has an individual graph with the date, time, and temperatures during the cycle. 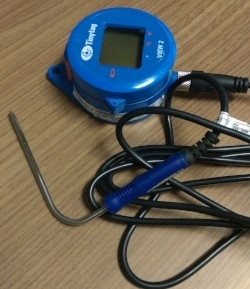 Another important piece of equipment is something simple - Thermometers! We use both digital and analog thermometers. There is one of each in each of our freezers. The digital thermometers connect to a cloud and log daily temperatures, the analog thermometers back up the digital. Our walk-in freezer is equipped with thermometers that not only email us daily with a log, they also email us to inform us if the power has gone out in case of emergency. This is extremely important during the stormy season! Labels are another extremely important item we must have. Every deposit, batch and bottle must have a label for us to easily identify who the milk belongs to, where it needs to go, when it expires and what the next step might be for it. The labels allow us to stay extremely organized, which is vital to ensuring we are providing safe pasteurized donor human milk. The last items to think about are the bottles we use. A bottle is a bottle, right? Wrong! Our bottles come to us pre-sterilized so that we know the milk is going into a safe container. They include foil seals inside the lids, which are adhered using an induction sealer immediately after being filled. The bottles are specific to the pasteurizer we use. They require cages to hold them in place and to keep them submerged in the water. The bottles must be able to withstand the temperatures of the pasteurization process and the freezer as well. Who would have thought so much was required of a simple bottle? Providing safe pasteurized donor human milk is our number one priority. All of the safety measures we take are to ensure the fragile babies and premature infants are receiving the best option available, aside from their mothers’ own milk. We are always looking for ways to rise above the standards, whether that be implementing new processes or equipment. It’s all important to the end goal. Why do we do it? The answer is simple. We care. If you’d like to read up on some of our bigger equipment, check out this blog! 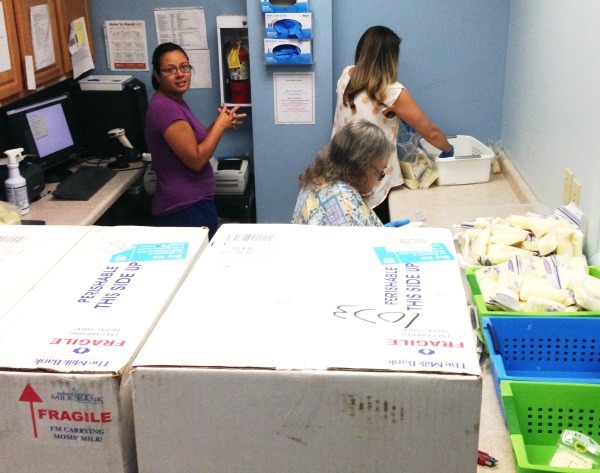 Why Do We Pasteurize Breast Milk Donations? We are often asked, “Why do you pasteurize your milk donations?” The simple answer is this: because pasteurization kills the bad while retaining the good. But that answer doesn’t always satisfy those that think breastmilk is best raw form. While generally, we agree: breastmilk is best untouched, our mission is to provide donor milk to the population of infants who are most susceptible to infection. It’s our job to provide the best nutrition while ensuring we do no harm. 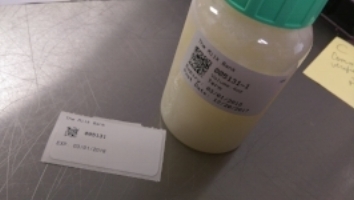 Both the American College of Pediatricians and the Center for Disease Control recommend pasteurized human donor milk if mother’s own milk is unavailable and that means we have a responsibility to ensure proper procedures. Before we pasteurize milk donations, we first make sure that our donors are free of communicable diseases and are generally healthy with limited medication use. We require a blood test for all our milk donors to check for HIV, HTLV, Syphilis, Hepatitis B &C. We make sure our donors maintain lifestyles that are compatible for donation- they are a non-smoker, aren’t taking a medication that will affect a premature baby and pump and store their milk in a safe way. But what about the milk itself? What in the milk is killed during pasteurization and what is maintained? First, let’s talk about what is retained. The enzyme that destroys bacteria by disrupting their cell walls retains 75 percent of its activity. Lysozyme, with many other bioactive components, allow a baby to create their own immunity in their urinary tract. Meaning, babies fed breast milk are less likely to develop a urinary tract infection. Oligosaccharides, a complex chain of sugars unique to human milk are unchanged by pasteurization. You might be wondering, why are these sugars important? They exist to feed the tiny organisms that make up a baby's digestive system. In fact, some researchers believe that human milk was evolved to be more protective than to provide nutrition. 70 percent of the concentrated IgA antibodies are also retained through pasteurization. These are the antibodies to things like E. coli, group B streptococci and Brucella abortus, all bacteria that can be harmful, if not deadly to a preterm infant. So, how does breastmilk change when pasteurized? The good news is, not much changes! Well, aside from the things we want to change like the elimination of pathogens and viruses. Some of you might have heard about lipase or have experienced high amounts of it in your own frozen milk, pasteurization inactivates the enzyme. Our final step to ensure sure the milk we are sending to the most fragile infants is completely safe involves testing for potential bacteria. Each batch has a random sample checked by an independent lab that performs a 48- hour culture to check that all potential pathogens and viruses are destroyed. If you have a question you would like answered, email us at info@themilkbank.org or connect with us on Facebook and Twitter. What was your first thought when you learned there was a local Milk Bank? Most often the reaction we receive is disbelief that such a resource has been around for 6 years in Indiana and much longer in other states. Sometimes, people ask if we help pump moms milk in our office. That makes us laugh. So, today we are going to dispel some misconceptions. Donors have to pay to donate: Not the case, in fact we cover all the cost of donating including the cost of drawing and testing your blood. We pay for shipping, we can provide milk storage bags, and if you’re local we’ll pick up your milk. The approval process is too intimidating: We hope not. From the packet we only need a few forms back. The Healthcare Provider forms will need to be signed by your doctors but we will fax them if you cannot get them signed. After we receive all the forms, the last step is to have your blood drawn. Donors can go to any Quest Diagnostic location and if the Quest location is not convenient, we will ship you a blood draw kit that you can take to a lab or doctors office or nurse to have your blood drawn. Quick tip: If you ask, most healthcare providers will donate their time to draw your blood if you explain what it’s for. My milk has been in the freezer for 6 months, can you take it? YES! If you are an approved donor, we can take milk that has been stored for 6-7 months. That means milk that was pumped 6 months ago. If you have a specific question, PLEASE CALL US! We do not want to see your milk go to waste. Why can we only accept milk that has been stored for 6 months? Breast milk that has been frozen for longer then 6 months starts to loose some of it’s nutritional value. IMMB can only accept milk that was pumped in my first 6 months post partum: NO! Not true! IMMB can accept milk that has been pumped throughout your child’s first year of life and has been stored in your freezer for no longer then 6 months. I donated 6 months ago when my baby was 3 months old, do I need to be re-approved? Absolutely not! Your initial approval is valid until your baby is a year old and milk you pump can still be accepted after their first birthday if it was pumped before they turned one. Confused yet? IMMB can only accept milk pumped in the bags we provide: Nope. We can send you bags if you need them but we can accept milk in any brand of milk storage bag. Ziplock bags excluded. We prefer bags to milk frozen in storage trays. I can’t donate, I’m taking prescription medication. Not so! There are some medications that are perfectly compatible with donating like synthroid or the mini pill. Prenatal vitamins are also fine if they do not contain herbs. We'd love to talk to you about your specific medication before determining if you're medication is compatible with donating. Email us, call us or find us on Facebook or Twitter! Human Milk Banking is too new. Not true! We’ve been around since 2005 but other Milk Banks associated with the Human Milk Banking Association of North America have been around since the 70’s. IMMB pays Donors for their human milk donation. Nope. Not true. We are a non-profit and rely upon the generosity of our Donors to be able to provide Pasteurized Donor Human Milk to premature and sick NICU babies. We are a community milk bank and look for community grants to help support our Mission also. People only donate for compensation. We have been so blessed to have received the excess breast milk from Doctors, Lawyers, Teachers, and Stay at Home Moms who have maintained a pumping schedule when they returned to work and have found they have more then their own child will consume. Our donors are willing to donate their milk without compensation because they know how important breast milk can be to sick or fragile babies. Pasteurized Donor Human Milk is free. Unfortunately, PDHM is not free. We wish we could provide the life saving properties of human milk to all babies for free but we can’t. So we charge a processing fee to our ordering hospitals to cover the costs of the milk bank. Why is PDHM so expensive? We wish it wasn’t but unfortunately we process the milk by hand. We thaw it, combine it and bottle it by hand. The only automated part of our process is the actual pasteurization that is done in a machine that brings the milk up to the appropriate temperature for the appropriate amount of time. Why can’t Donors ship milk on Thursdays? Simply because Thursday is too close to the weekend. If the shipping carrier would mess up and not deliver your milk on Friday, we wouldn’t get the box till Monday and there is nothing worse than breast milk sitting unrefrigerated for 3+ days. So, to be on the safe side we ask that Donors only ship to us Monday thru Wednesday. Why isn’t there a Milk Depot near me? We’d like more depots! We’d like to make donating to us the easiest experience possible and Milk Depots help to alleviate the hassle of packing a box, finding dry ice and taking the box to UPS. If you know of a business or organization who would be willing to volunteer their time to be a Milk Depot, let us know! Someone in my home has a cold, can I donate milk pumped durning that time? We ask that you notify us if someone in your household has more then a cold so that we can determine the level of risk to the milk. Most times that is no reason why we cannot accept milk pumped during these times. Our biggest concern is medication. If you become sick and take a medication or herbal treatment, please let us know. I called you today, why didn’t you return my phone call today? Please forgive us if this is the case but please know that we are a staffed with 3 full time employees who wear many hats. Trust us, we’re just really busy. Please have patience with us. Always feel free to email your need or request, we can answer emails long after we’ve left the office. We're available on Facebook and Twitter too!